Lexington Vintage Dance is proud to offer for sale our second collection of historic dance music. When we released our "Regency Romp" CD in 2005, it was our intention to follow it with a "Romantic Revel" at a later date. 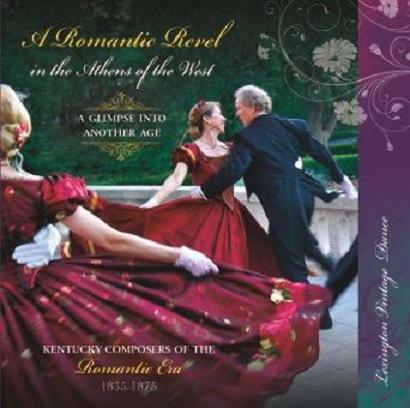 It never occurred to us, however, that we would be able to fill a CD entirely with music by Kentucky composers---and not just music, but actual "gems of the ballroom," music that compares with any popular music of the period. Arranged in a style authentic to the era, it is a delight for listeners as well as dancers and provides a rare glimpse into another age and sensibility in Kentucky, one that few today would suspect existed. Local names abound in the titles of the compositions and should warm the hearts of natives in suitable fashion. If one has any taste for music of the Romantic Age, or even the mildest curiosity, then this collection is not to be missed under any circumstances. Arranger: Nikos Pappas. Conductor: Kelly Sikorski. Musicians: Brice Farrar- violin 1, Anna Hess and Jessica Tzou - violin 2, Rebecca Kiekenapp - cello, Merrilee Elliott - flute and piccolo, Mike Acord - clarinet, Joel Crawford - cornet, Nathan Miller - bariotone saxhorn, Jay Flippin and Larry Crawford - piano. Click on the song titles to listen to a small portion of that song. To listen you will need either Quicktime or Windows Media Player. Both of these are free. Included on the CD are PDF files with program notes by the arranger, an essay on the dancing of the period, and hints on using the CD for a ball. To order your cherished copy on-line using PayPal or a credit card, click on the Buy Now button above. To order by mail, send a check payable to LVD to the address on our contacts page. Cost is $20 per 2-CD set, plus $3.50 shipping inside the US. For other shipping situations, please inquire. Kentucky residents add 6% sales tax. Schools and other institutions in Kentucky that are exempt from paying Kentucky sales tax may order CDs by mailing an order with payment ($20 per CD-set plus shipping) to Lexington Vintage Dance, c/o Michael French treasurer, 3480 Keene Road, Nicholasville, KY 40356. Please include a copy of your sales tax exemption certificate. Registration will open on August 1, 2019 at Noon. Our Romantic CD is here! Our Regency CD is here!